All my life I've come up with nicknames for people — mostly for those who I don't know their real names. For instance, there's a local attorney that runs television commercials with a striking resemblance to a certain rodent so he's known as The Woodchuck. There are a number of characters at my mother's assisted care facility. 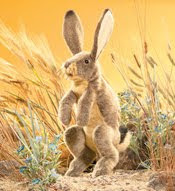 Today I will tell you about The Jackrabbit. The recreation room is where most of the residents spend their days. It's the only part of the building that is air conditioned so it's the place to go to keep cool. There's a large screen television there tuned to the TV Land channel and they watch Bonanza and Gunsmoke all day. There are plenty of tables where the activities directors play bingo or conduct other activities. The Jackrabbit has his place in the recreation room. He sits, day in and day out, in the same chair at the back of the room. He never speaks which made it difficult to ascertain his status — sane or not. I'm still not sure and I'll have to follow up with the staff. If I know he understands me, I'll make sure to speak to him. Otherwise, I won't take offense if he ignores me, too. A man went into the bathroom located in the back of the rec room next to The Jackrabbit. The man left the door open and we all listened to him tinkling. The man no sooner got out of the bathroom than The Jackrabbit leapt from his chair and ran into the bathroom. I thought he had to go as well but I saw him pull a length of toilet paper from the dispenser and wipe off the seat where the previous man had "sprayed." Yeah, these bathrooms that are accessible to everyone have the men going all over the place. It must be frustrating to work there knowing that as soon as you clean it up, the next person in is going to foul it all up again. About a half hour after the bathroom display, a woman went to open the folding doors where all the games and activity items are kept. The Jackrabbit sprung into action, carefully pushing the doors closed and using his hands to indicate that she wasn't to go into the cabinets. She understood and went about her business. It's clear that The Jackrabbit knows what's going on and keeps an eye on the others, making sure his corner of the recreation room runs in an orderly, clean, and safe fashion. Now, The Baby Mama sat next to him and kept trying to engage him. She had a teddy bear instead of her doll and she "babbledy babbled" at him to explain what the bear was thinking or doing. She was giving it a drink from an empty plastic cup and I thought I could make out that she was warning it that it was going to have to tinkle if it kept drinking so much water. I could tell The Jackrabbit was watching her with his peripheral vision but he just sat and ignored her. He sits, staring straight forward without a word, until he needs to tend to something urgent. When The Baby Mama reached for his arm to get his attention, he gently pushed her hand away but never made eye contact with her. I wonder how long this dance between the two has gone on? Just that day, or is it constant and been going on for years? My Mother worked at a mental hospital for years. Some patients could get a grounds pass to go out for fresh air. Your series has reminded me of one of them. This man was known to many as the statue. He would go to the edge of the grounds and stand all day watching traffic go by and he never seemed to move so much as a finger.